Part 3 for The Coffeevine October 18 box, in this post I’ll only write about the coffee from April Coffee Roasters. In the ‘preview October 18 Box’ post, you’ve been able to read about the coffee and also what I expect from the coffee. In this part, I’ll share my recipe for an awesome pour-over and Espro travel press as usual. 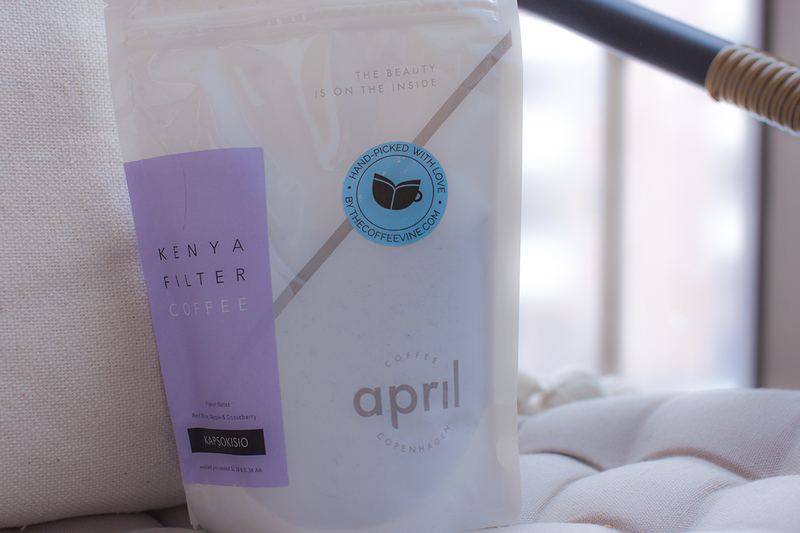 As I was cupping April Coffee Roasters – Kapsokisio I could find a few notes that weren’t mentioned on the bag. First I felt a strong taste of blackcurrant that ended quite early with a balanced taste of rooibos tea. There’s also a hint of apple, something April Coffee Roasters and I had in common. I’ve written a different 4:6 recipe that differs from the first two, I prefer to make this coffee a bit more acidic as I love that with a Kenyan coffee. So I begin with 70g of water. More detail will be written in the recipe of course. I would also like to know how good this coffee would be with “fika”. I tried it with a dark chocolate with sea salt. I understand that this can be a weird thing to try out, as almost all coffees are well matched with chocolate. But there are those who really don’t, and that may mean they are only preferred enjoyed on their own. For example: Do you like green tea with chocolate? I certainly do not. In this case, as we do know dark chocolate has a more acidic side, and this is personally to edgy to combine for me. Blackcurrant, apple with rooibos tea finish. 1) Pour 70g water for blooming for 45 seconds. 2) 45 seconds in, begin your second pour of 50g of water. Well, I wasn’t wrong this time. But perhaps it’s because of my adjustment of the recipe the acidic potential is at its highest. I had problems getting the red wine with several tries, but blackcurrant, apple & rooibos tea was something strongly noted. So as Tetsu Kasuya explains with his 4:6 method: using more grams of water in the first pour will give your cup a greater acidic coffee and that was my intention from the beginning. I have to admit that both the flat, mild and sweeter (more water in the second pour) was great. However, I did not get what I unless it was this level of acidity. If you have an Espro and a Pour-Over … What should you choose to brew with? As I wrote above, you get a more balanced cup with the Espro, you also get a great result every time as it’s impossible to make mistakes. Do you want your cup to show a bit of aromatics, brew with a Hario V60 etc. It becomes more spicy, aromatic and nicer on its own. This coffee is quite versaitile which makes it great with both brewers!